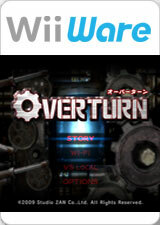 Overturn: Mecha Wars is a tournament-based game where two challengers go head-to-head. The tournament consists of six classes: Rookie, Novice, Elite, Ace, Grand and Master classes. Games take place within closed battlefields with the contestants controlling futuristic machines equipped with a host of high tech weapons. The aim of the game is to blast your opponent using the 19 available weapons, while trying to avoid their incoming attacks, ending up as the last one standing. Each of the eight machines has its own unique features with selectable weapons that increase as the player progresses through the tournament. The game will also give players the ability to customize their favorite Mecha once parts have been unlocked. The game can be played by one or two players (split screen) locally or with two to four players via Nintendo Wi-Fi connection. Overturn can also be played by using the Wii Balance Board and utilities the Wii Remote speaker, allowing the player to experience WiiWare games in a unique and exciting way. The graph below charts the compatibility with Overturn: Mecha Wars since Dolphin's 2.0 release, listing revisions only where a compatibility change occurred. This page was last edited on 4 March 2018, at 03:56.